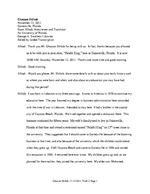 Ghassan Shihab, 11 12 2011, Draft 2, Page 2 graduated from the University of Florida Law School and he is doing good now. He is practicing law in Riyadh, Saudi Arabia. Alhadi: We will come back to your li fe in America, but I want to go back to your period before you came to America. You are originally from Lebanon. I want to ask you to tell us more about your early life in Lebanon. What village or city were you born in and what schools did you attend be fore your coming here? Shihab: I was born in Beirut and finished my high school and two years of college education there. I then moved here. Alhadi: What college did you go to in Beirut? Shihab: I studied business administration in the Protestant Colle ge. Alhadi: Did you come here alone or did you have a family with you at that time? Shihab: I came alone. I had a friend who came to America before me to study. He suggested that I should come here to continue with my education. I requested a college application form and upon receiving it, I filled it out and sent it back. Soon after that, I got admitted and consequently came here to do my studies. Alhadi: Would you please tell us about the study that you did here? Which college or university did yo u go to, and what did you study? Shihab: I studied at Daytona Beach Community College for two years. I was working while I community college study, I got admitted to the Unive rsity of Central Florida in Orlando. I was commuting three days a week until I finished my study. Alhadi: Very good. After coming here and getting settled, did you continue to be in touch with your family in Beirut? Did you go there to visit? Ghassan Shihab, 11 12 2011, Draft 2, Page 3 Shihab: I go there every five years to visit. I spend two or three weeks. Alhadi: When did you go there last time? Shihab: It was last year. I went to do the Hajj in Saudi Arabia and from there I went to Lebanon and then back to here. Alhadi: What about your to visit? Shihab: They go once every two years. My wife takes the children so that they will know their family back in Lebanon. This helped them to be good Arabic speakers. Here, we also speak to them in Arabic and we have kept this relationship alive. Alhadi: That means they speak good Arabic. Alhadi: This is a problem that is facing all the Arab children who were brought up here. They Shihab: That is exactly the case with my children. We talk to them in Arabic and they answer back in English because it is easier for them. Alhadi: Mr. Abu Mohamed, you have been living here in Gainesville for quite some time. How is your relationship with the other members of the Arab community here and how do you see the Arab community here doing? Shihab: The Arab community here in Gainesville i s getting stronger and bigger. Its members are also getting more connected with each other. They form groups and meet and also organize celebrations of their religious occasions and festivals. I can say that relations with each other are good. Ghassan Shihab, 11 12 2011, Draft 2, Page 4 Alhadi: What do you think the Arab community offers the surrounding society in Gainesville, Florida, or the USA at large? Shihab: Those who are in charge of the Arab community are trying to make the Arab community create a presence. Here in Gainesville, the Arab community has a Arab community to make others understand and know that their community is doing its best to become an integrated part of the bigger society. Alhadi: That is good. It is a fact that most of the Arabs who are here in America, or more specifically, in Gainesville, are either professionals or employees. Very few of them own f stores owned by an Arab. How do you see the business situation for you as an Arab person residing here in America? Do you face any specific problem? Shihab: My business is a Middle Eastern food restaurant. When I came here to Gainesville, I figured t hat this city lacks a store that offers typical Arabic food. I started my business in 1984, and continued to be here ever since. I felt there was a gap in this area and, by opening this store, I feel I have filled this gap. Alhadi: Do you find that Amer icans are getting used to the Middle Eastern food? Do they like it? Do you have customers who regularly come to your store? Shihab: Thanks to God. We have customers who regularly come and eat here. Most of them are vegetarians and they come here becau se we offer humus and falafel. These dishes will add to their salad and veggies options. Thanks to God that many of them favor our menu. Ghassan Shihab, 11 12 2011, Draft 2, Page 6 troubling, hard to do, a nd nothing more than a big headache. I decided to stay focused on this one, and because of that decision my income has remained the same. It was hard commuting between the two stores, and this one is doing well. Thanks to God for that. ALHADI: Mr. Abu Mohammad, what do you, as an Arab owner of a well known business here in America say to those who suggest that Arabs have no chance of succeeding in this country? Shihab: I think everyone who comes here and works hard and is serious will be rewarded. It should work harder, and that is the only way for them to make it through. Alhadi: Is your business facing any problem of any kind because of you being an Arab? Shihab: Not at all. An Arab person is like a Mexican or any other person from any other country. There are opportunities for all. If everyone abides by the law, then he will get his share. This applies to everyone regardless of his ethnic background. Alhadi: Bac k to your business history. Is this store the first Middle Eastern food store here in Gainesville? Shihab: We had one before, on the corner of 13 th Street at University Avenue. That one opened in 1983 and had the same name of Falafel King as this one. It was owned by my father in law. I joined them and opened this one. Alhadi: Why did the other one go out of business? Shihab: The rent was going up every year until it reached the point that made it inconvenient for us to stay. Alhadi: And after ope ning this store, were there other ones that came later? Ghassan Shihab, 11 12 2011, Draft 2, Page 7 Alhadi: Yes. There were other stores that sprang up wanting to do this kind of business after mine. We, the Arabs, are smart. Some employees come and work with us. They very soon master the profe ssion and go and open another business in another part of the town. There are two stores that opened after ours and they sell the same materials and offer the same menu as we do. Alhadi: Do you, as store owners, communicate and cooperate with each other? Is it possible for each one of you to get something from the other store if one of you is running short on that item? Shihab: This happens all the time. They are my friends and I always get what I need from them rather than wait until my shipment arrive s. We help each other. I give them what they need when the need it and they do the same for me. Alhadi: That means the relationship between you is not a competitive one? Shihab: Not at all. Every one of us works in an area that is far from the others and although Gainesville is small, everyone gets his share. Alhadi: Where do you get the goods from? Shihab: There are many Middle Eastern food merchants in Orlando, New York, and Tampa. We get most of our items from wholesalers in New Jersey, Orland o, and Tampa. They have all that we need. such as Lebanon or others? Shihab: Wholesalers import goods in big containers from the Middle East and then they distribu te them to the retail stores in America. It is hard for a store owner like me to get a whole container. You need to have an export and import business do that. Ghassan Shihab, 11 12 2011, Draft 2, Page 8 Alhadi: In terms of the goods that you have here in your store, do you encounter any problems with the authorities here? Do they come and check on your items? Shihab: No. The items we have are checked when the containers arrive from the port of shipping. After the wholesalers get their shipments, they distribute the items. That means the goods we have here have already been inspected. Alhadi: Now, Abu Mohamed, I want you to propose a breakfast meal for someone who wants to have breakfast. What would that meal consist of? Shihab: If the customer is vegetarian, then he may get a plate of falaf el, humus and tabouli. These are some of the famous items we have. We can also offer him bread with his meal. This will make a full meal. For those who eat meat, they can order shawirma which is a mixed lamb and beef meat. We may give him humus, tabouli and bread. This is also a full meal. Alhadi: What about other meals such as dinner? Do you have a special dish for dinner? Shihab: No, we offer the same menu for morning, noon, and evening. We have other side items such as pickles, spinach, and rolle d grape leaves stuffed with rice. Alhadi: Do you think that Arabic food is becoming known to American families? Do they cook it at home? Shihab: American families are becoming more accustomed to Arabic food. Here in this store, I have this front part which functions as a restaurant and the back side is a grocery section. Some people prefer to cook their own recipes. It is hard for them here in Gainesville to find the ingredients they want in other stores. They come here and get what they want to coo k at home. This shows that Arabic food is gaining ground here. Ghassan Shihab, 11 12 2011, Draft 2, Page 10 to do. Because of his love of computers, he entered an information technology program. T he elder one was determined from the very beginning to become a lawyer. He loves reading and knowing about different things. We also gave him the freedom to choose r favorite fields. Alhadi: Would you please introduce their names? Shihab: The elder one is named Mohammad and he is a lawyer. The middle one is named Taha and he graduated from the information technology program at the University of Central Florida. T he younger one is named Waseem and he goes to Santa Fe Community College. He will be done in one semester. After that, he will join the University of Florida here in Gainesville. Alhadi: That is excellent. I pray to God that he may give his support to all of them. Shihab: Thank you. Alhadi: What is your middle son doing now after he graduated from the information technology program? Shihab: He graduated two years ago and kept looking for a job for a whole year because the economy was not in good shap e. He continued living with us at home. Thanks to God that he is now working for an IT company here in Gainesville and he is still with us at Alhadi: When you came to America, did you come directly to Florida, and have you been living here all along? weather we have in Lebanon. I have been living here in Florida ever since.